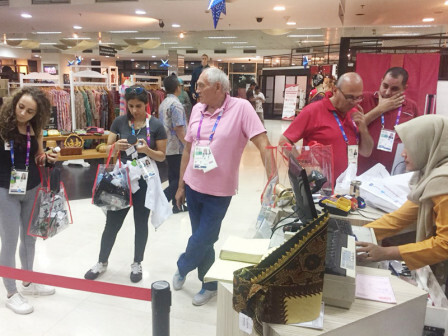 Athletes, delegations, and officials from Asian Games participating countries are interested to have shopping tour and historical tour while they are staying in Jakarta during Asian Games 2018.
" Shopping and historical tour packages are the most favorite packages"
"Shopping and historical tour packages are the most favorite packages chosen by Asian Games 2018 athletes, delegations, and officials from total four tour packages offered," mentioned Asian Games, Acting Jakarta Tourism and Culture Dept. (Disparbud), Tuesday (8/28). He explained, many of those athletes, delegations, and officials who buy Indonesian products, including handicraft products as souvenirs and mementos from Indonesia. "They are mostly interested in handicraft, batik cloth and scarf, Asian Games mascot and shirt," he informed. Regarding tour packages, he added, most delegations choose to have historical tour such as visiting National Monument (Monas), Maritime Museum, and Kota Tua. "After Asian Games event, we hope there will be more foreign tourists visit Jakarta," he conveyed.